Ask fellow campers about "On The Beach RV Park" and nearby attractions. This park is excellent. Very clean. Wonderful, helpful hosts. Had a toilet problem that the host diagnosed, told me where to get the parts, and helped me reinstall it. Asphalt roads, gravel pads almost level. 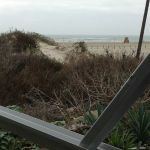 Park is inside the dunes with easy walking access to beach. Fast WiFi. We will stay here again! We camped at On The Beach RV Park in a Travel Trailer. ACRV Parts Store is well stocked. Had the Thedford toilet water valve I needed. La Playa is great Mexican restaurant on Beach road. Good food. Lots of different tequilas. Try the owners margarita! Beach is one of the best on the Texas coast. When we arrived we found the staff to be very helpful. We asked questions about things to do in the area and they were glad to help us out. The sites were a little bit close together, but it would not stop us from returning. The beach is about a block away by foot. The bathrooms and showers were clean, and the park was well kept. This was our first trip in our first new camper and we enjoyed our visit. We camped at On The Beach RV Park in a Travel Trailer. Talk to the staff. They will give you ideas for good places to eat. If you want to pick up shells on the beach then get out there at sun up before everybody else picks them up. Beware-low voltage! D8 and D7 showing 90 volts on my reliable voltmeter! Will ruin electric appliances-AC/Microwave, etc. Manager refused to offer ANY compensation. She was rude (walked out of the office and left me standing at her desk). Finally, 2 days w/o AC they told me I could move to a different site. Voltage normal there (117V). Because of lack of customer service and low voltage, patronize a different RV park! We camped at On The Beach RV Park in a Travel Trailer. Our stay is little different than others, it was in June, not a winter month. Place was packed. I think there were two spaces left when we reserved ours. Like most of the reviews say the park is clean, staff friendly, and it is very close to the beach. There's a golf cart rental service within walking distance if you need one. We rented one for a day and half just to ride up and down the beach and through town when going out to eat. Overall there is absolutely nothing with this park. it is older - meaning it wasn't built for lots of monster RVs, but there is limited space to fit some of the monsters. All that being said, yes the sites are close together here's an idea: We arrived on Thursday evening, A,B,C class RVs have an option to face the beach or dunes. While we were hooking up I decided not to hook up our sewer hose, until we left, because it was underneath one of our neighbors lawn chairs. Plus the neighbors on both were super friendly and who wants there bbq interrupted by someone opening the sewer cap next to the grill? We have been to Port A more times than I can count at other RV parks and condos. The beach was packed! Finally if you need a pool, there is no pool. Restrooms are older, but clean. If you've been RVing for a while, you're used to it, these are just fine. Smaller but fine. With the popularity in people owning travel trailer, 5th wheels and motorhomes increasing over the last 10 years reservations are a must these days. Don't just get here and expect to pull in, especially on a weekend. We camped at On The Beach RV Park in a Motorhome. It get's quite crowded, There was not enough space for our Jeep behind our motorhome. Nice location. About a block to the beach. View of the beach was limited. Friendly helpful staff. We stayed a couple of nights and would go back without hesitation. It didn't seem like there were any full-timers there. We arrived the week after spring break crowds and we got the impression that spring break is not the best time to be there. One of the few parks with working cable TV. We camped at On The Beach RV Park in a Motorhome. This quirky older campground is absolutely charming if you wish for quiet, sea breezes and and want to be only 100 feet to the water's edge. Nestled up against the gulf-side dunes you have all the advantages of seaside living. Most of the campers are Midwesterners down for the winter but there are some revolving spaces that are available from time to time. We found the office staff efficient and kind and the full-time maintenance worker was always quick to assist campers. The landscaping in the park is beautifully done and makes camping there extra-special. If you want a pool and a kiddy train and lots of activities, this isn't your park. If you want to hear the wind and waves, see if they have a spot. It's expensive, but worth it. We camped at On The Beach RV Park in a Motorhome. We stayed 4th July weekend and didn't realize we needed to make reservations many, many months in advance as many of the parks were booked up. This one had availability so we were pleasantly surprised to find out this park was delightful. We were in a large rig, 43 ft. There are only a couple spots that fit our size rig. We were in row "B". The majority of the park was filled with travel trailers and 5th wheels. The best thing about this park is its vicinity to the beach. I didn't find any other park that allowed such close and easy access. We were a block from the beach. We drove through all of the RV parks in the area and determined "On The Beach RV" was one of the nicer parks. Many of the parks were crammed together with cement and no green space or personality. The spots here are close together but had REAL lush green grass! They also have tropical landscaping throughout the park. Other parks were only cement. It's obvious the park manager has a green thumb. This park is older but quaint with personality, not the typical sterile RV park. Park manager is very tough, lots of rules, especially about dogs. Don't even think about walking your dog within the park grounds! Manager has no personality, however the parking director was great and assisted everyone with getting their units into their assigned spots. It's a little crazy getting in and out of the park at check in time. There is an adjacent large but well maintained vacant lot adjacent, which is used for parking overflow. 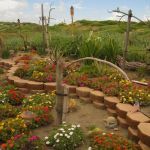 A beautiful garden of succulents can found here. Cement pad for picnic tables, each table was freshly painted a vibrant color. Row B has all the motor homes, the other spots appear to be occupied by travel trailers. Our unit faced west which was uncomfortable in the afternoon, nothing the park could really do about this as the spots face East/West. Either way you get the morning or the afternoon sun. We experienced power interruptions throughout our stay. Prices are stupid. Nickle and dime you for everything. We camped at On The Beach RV Park in a Motorhome. Shuttle to Port Aransas stops in front of this park. Park is steps from the beach. 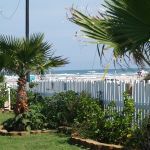 Great "On the Beach" RV park that is as close to the beach as you can get without camping on the beach. View of Gulf of Mexico out front window of motorhome. Great, friendly staff. ONLY drawback....tight sites and roads but crew helps you park. We camped at On The Beach RV Park in a Motorhome. Great little town, Port Aransas. Wonderful eateries and shops. Just a short drive (or free ferry ride) to Corpus Christi with their aircraft carrier, etc. Rate based on 30 day stay and includes additional charge for electric. Rates vary depending on site selected. Pros: friendly and helpful staff; short walk to the beach. Cons: WiFi works but was constantly dropping connection; light pollution-too many standard street lights that even ruin a nighttime beach walk; unleveled sites; narrow sites. We camped at On The Beach RV Park in a Travel Trailer. Stayed for 4 days. Small but well maintained park; just like the name, on the beach. Just a short walk to public beach. Beautiful sandy beach, great sunsets! Park staff very eager to help out and constant grounds maintenance. Shade and nonshaded sites. Includes cable hookup. Would definitely stay here again. We camped at On The Beach RV Park in a Fifth Wheel. Had ok meal at Virginia's. The oysters were very small and pricey. Beautiful park, clean and well kept, nice to have the fresh Aloe for sunburn, best shower ever, strict dog policy but no poop on grass, very friendly/helpful residents, from B9 to water's edge (GoM) = 107 meters (I counted), nice beach; TxDoT/TxGLO did good job with beach maintenance, did not encounter jelly-fish but told an occasional issue, water temp 82 degrees, will definitely be back. We camped at On The Beach RV Park in a Motorhome. Sites are too tight to enjoy. When it rains you walk around in ankle deep water in most of park. Restrooms and showers are old and dingy, appear to have been built in the 50's. Most of staff okay except for one that thinks she owns the park and makes life miserable on daily basis. Owner is a nice lady, needs to evaluate her help as it is costing her business. Most of buildings in park are falling down around themselves. Lot's of rules for campers but an angry staff to deal with. Park needs to close. We camped at On The Beach RV Park in a Fifth Wheel. Port Aransas is great little beach town. We stayed here in 2011 and loved it. Our campsite was right next to the sand dune #H7. Friendly folks all thru the park. Spring breakers were coming in on March 8th so we left. It was gonna be getting busy. Loved this place and will recommend it to others. We would definitely stay here again. 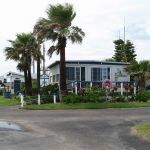 (The rate reflects a 30 night stay of $580.00) We camped at On The Beach RV Park in a Motorhome. Due to some confusion on their part, our pull through site became a back in with all hook ups on the wrong side. Very tight, short sites. WiFi doesn't work, cable TV not good, washers in laundry room do not work well. Work campers where very nice, manager was what we expected. We lived on the island in the 70's and come down here often, so our expectations of convenience and customer service were not high. We were not disappointed. We will not stay here again. Rate was based on weekly rate. Island mentality, take it or leave it! We camped at On The Beach RV Park in a Fifth Wheel. Are you affiliated with On The Beach RV Park ?